Reports from Susan Slusser of the San Francisco Chronicle have the Oakland Athletics acquiring middle infielders Ben Zobrist and Yunel Escobar in exchange for C/DH John Jaso and minor leaguers Daniel Robertson and Boog Powell. For the A’s it’s an upgrade up the middle with Escobar and Zobrist. For the Rays it is a pairing of payroll that will save them $11.5 million or so depending on what Jaso who is 3rd year Arb eligible this season. Zobrist was in the last year of his 6 year $30 million dollar deal he signed with Tampa Bay. This season he was due $7.5 million on the last option year of his contract and would have walked as a free agent after the 2015 season. One of the most coveted players in baseball by Sabermetic followers with his 5 WAR makes him a great value. His ability to play multiple positions makes him a mangers dream come true. Zobrist broke into the big leagues as an SS with the then Devil Rays but didn’t have the range to play there everyday. Joe Maddon brought him to spring training the next year and asked him to play every position that he could SS, 2nd, 3rd, and OF becoming what Maddon called a SuperUT playing somewhere new just about everyday. He was always able to hit and now with a chance to play everyday albeit in a different spot he flourished and gave Maddon the chance to create the ultimate match up line up everyday. His offense has been questioned over the last few seasons on a club that has struggled offensively. He has been asked over and over to provide protection for Evan Longoria. In Oakland he will be able to play multiple spots, I see him used mainly as a 2nd baseman but he can play in the outfield when ever asked and not have a drop off defensibly one bit. Escobar was in the second year of a 2 year $13 million dollar deal he signed last year that has a $7 million dollar option for next season. Solid glove up the middle with some pop that will really help the A’s pitching staff gobbling up grounders and being able to make the play deep in the hole. Bat wise he hit 258 last season in 137 games. There have been concerns with his attitude dating back to his time with Toronto. Interesting trade for the A’s who I think are looking at his glove more than his offensive numbers. The A’s want smart hitters who know how to work a count. Escobar struck out 60 times compared to 43 walks, and does not steal much. Something to watch is if he makes the adjustment at this point in his career to be more of an A’s type hitter. The Rays preach hunting for fastballs and getting into hitters counts but sometimes that was lost on Escobar. The Rays bring back John Jaso who they shipped away a few years ago. He was a clubhouse favorite with the Rays and Joe Maddon. His first tour with Tampa Bay he picked up the nickname “Mikey” by Carlos Pena who didn’t know Jaso’s real name and kept calling him by the wrong name until it stuck. Where he will play for Tampa Bay will be interesting. An OK catcher behind the plate with a better bat than his glove. He has suffered concussions over the years and now projects more as an everyday DH as he heads into his 3 year of arbitration eligabilty. Last season he hit .259 with 9 HR and 40 RBI in part time duty. He is free agent elagible in 2016 like Zobrist. So if you are counting assets at the end of the season, by trading Zobrist as part of this deal that includes John Jaso, and if the Rays make a qualifying offer to Jaso (assuming they would do the same with Zobrist when he becomes free agent eligible) the Rays still have a chance to get a valuable sandwich pick for losing a free agent while saving more than $11 million on the transacation. The two minor leaguers the Rays get as part of this 5 player deal are top rated prospect Daniel Roberston and OF Boog Powell. Tampa Bay fans will have to cool their heels for a while if they want to see these two as they both played in Single A last season. Robertson a 2012 1st rounder (34th over all) became the A’s top infield prospect once they dealt away Addison Russell last season. He has some pop hitting as a line drive hitter with 15 homers and 37 doubles last year in A Ball with 60 RBI. Whether he will be a SS or a 3rd baseman in the majors is yet to be determined after his Arizona Fall League campaign. Was he going to be a A’s type hitter or was he still a work in progress because he stuck out too many times versus the number of walks he drew was something the A’s had to consider. His K/BB numbers were 79/41 in 2013 and 94/72 last season and the A’s preach working a count more than anyone else in the game. Powell is a much different player than the one who played for the O’s and has that great BBQ at Camden Yards. He is a .280 of better hitter in the minors leagues at the age of 21. He does have a 451 OBP and will draw a walk better than Robertson, illustrated by his 26/34 in 2013 and 53/61 K’s vs BB. 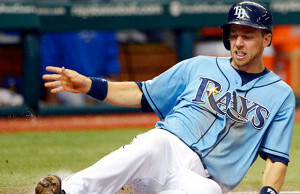 Bottom line, the Rays shed $14.5 million in payroll and open playing time for Nick Franklin who they are high on. The Rays had already signed Asdrubal Cabrera for $7.5 million which I knew gave them one too many $7 million dollar middle infielders. But evidently it gave the Rays two too many $7 million dollar middle infielders and Escobar was sent packing as well. With this deal now done maybe it opens the window for former number one pick Tim Beckham to finally contribute or a chance down the line if Hak Ju Lee is ready and recovered. They will also get a much coveted sandwich pick if Jaso walks via free agency. The A’s don’t rebuild a team that stumbled to the end of the regular season, instead they reload even more during an already bust offseason with two Plus Players that help them win right now for a catcher that needs to DH more, plus one prospect who may or may not not have fit the A’s way of hitting. The Rays needed to get an impact player in return for Zobrist for this deal to work and that will be the key for the Tampa Bay, if Robertson can develop into that player by 2017 it’s a win win for both teams, if not by including Escobar they open themselves up to a lot of second guessing.